My name is Amanda and I live on the beautiful Gold Coast in QLD. I'm a mum of 2 boys, Ryder 4 and Frankie 2 and my lovely partner and I are expecting our third child which is due in March 2016. I work in the airline industry at Gold Coast Airport and have been working there for 9 years. My spare time I dedicate first to my family and then my little hobby turned small business when I have time left over, which is mainly when the kids go to bed, or if I have a day off during the week while the kids are at Kindy. I make decorative party supplies including cake buntings and cake toppers and I also dabble in occasional greeting cards and tags. My main source of material I use is Paper, I love the diverse variety of patterns and textures that come with paper, which I source from all around Australia. My absolute favourite colours to work with are pastel pink and gold glitter and you'll see a lot of this colour combination in my work. I love to add details of pretty laces and ribbons in pastel rainbow colours to my work as well. My inspiration comes mainly from inside my creative mind. I lay all my pretty colours of cardstock out in front of me and play around with what colours and pattern combinations i think work best. It's bascially just trial and error once I cut everthing out, and If something doesn't get used, its put to the side for use another time. I also turn to Pinterest and Instagram where I search for on trend colour combinations and look at party design and colours. I have always been creative ever since I was a little girl. My Grandma taught me to sew, hand stitch, crochet, knit, but it wasn't until I finished high school that I started painting with acrylics. I would set up my little stall at the local markets on the Sunshine Coast on Sundays and sell my artworks. 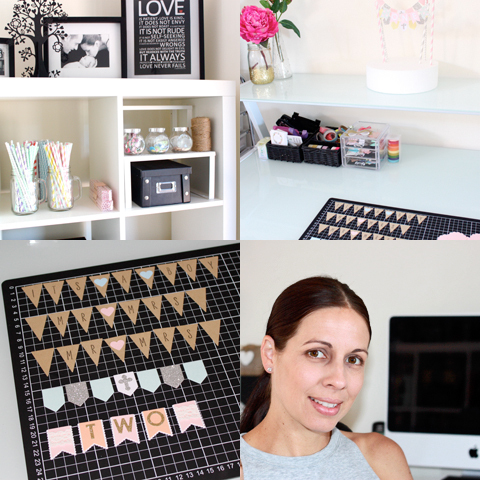 I stopped painting when I moved to the Gold Coast and started up cardmaking about 4 years ago. Although I still make cards now my main passion now for the last year or two has been my cake buntings and cake toppers. I guess I wanted a name that represented me as a small little hobby/business, hence the 'Little'. 'Paper' of course being my main material I use. I then just threw around words that would go with that and that's how I came up with Little Paper Stand. Throughout High School I studied double subjects of visual art, where I learned painting, printmaking, sculpture and mixed media and drawing. These days I really don't refer to any classes or groups other than an occasional look at techniques on you tube. Firstly be patient!! Think of your journey your about to embrace on as a marathon and not a sprint! Be your own kind of unique and don't try and base your business off something that is already in existence. The use of great photo's is extremely important in online selling so really work hard at getting your products to tell a story through the use of photography. Use social media to the fullest!! I find this is the cheapest and most effective way to get customers seeing your products, following your pages and direct sales back to your madeit store. But again having great photos that appeal instantly is a must. One of the lessons I have learnt is to never undersell yourself. I always tried to keep my prices low in the hope to sell more. But I now know that buying handmade is not the same as buying a $2 birthday card from the cheap shop and its more about quality over quantity. At the end of the day you need to factor in cost of materials, time, packaging, postage, advertising and any fees involved with selling while giving yourself a profit for each item you make. Spending time with my family. I mainly work on weekends, so when I do get a day off from work on the weekend we try and go to the beach and have some quality family time. We love having picnics or fish and chips in the park. I'm really into adult colouring in books at the moment, especially the series from Johanna Basford. My perfect day would be to wake up to a view overlooking Waikiki Beach in Hawaii. Enjoying a buffet breakfast, a day on the beach and an afternoon of shopping in Waikiki. Then topping off the day by eating dinner at The Cheesecake Factory followed by a big piece of Red Velvet Cheesecake. Heaven!! RazzleDazzle4U - I really love Razzle Dazzle 4 U for her beautiful, colourful and original baby mobiles and wall hangings.